There's a lot to unpack regarding the recently concluded NPT Review Conference. Despite the failure to reach agreement, there are some encouraging trends. See below for a concise guide! Plus the latest developments in the Marshall Islands Nuclear Zero cases in the International Court of Justice and more. PS: LCNP is now doing mid-year fundraising - your tax-deductible support is needed and appreciated. Click the Donate Now button or send a check to LCNP at the address at the end of this eNews. 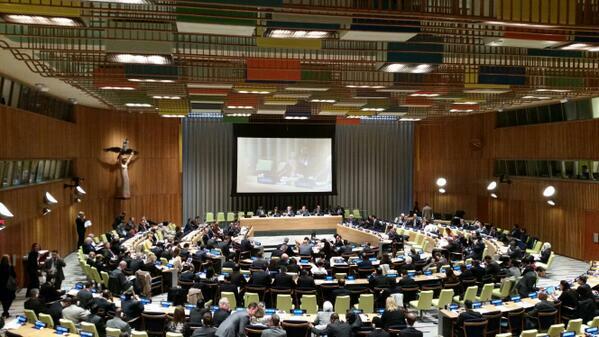 2014 NPT PrepCom in New York. Image: UNRPCD. No agreed outcome was reached at the 2015 Nuclear Non-Proliferation Treaty (NPT) Review Conference, held at the UN from April 27 to May 22. The robust debate revealed deep divisions over whether the nuclear weapon states have met their commitments to dealert, reduce and eliminate their arsenals, and whether modernization of nuclear arsenals is compatible with achieving disarmament. Ambassador Abdul Minty of South Africa conveyed the frustration and sense of betrayal of many states, stating that when the NPT was indefinitely extended in 1995, "we did not think that twenty years on, we would remain in the very same place as far as nuclear disarmament was concerned." Together or individually, the NPT nuclear weapon states - the US, UK, France, Russia, and China - largely succeeded in keeping provisions on these issues out of the draft Final Document, touting instead their supposed "step-by-step" approach. They also rebuffed proposals from the Non-Aligned Movement, representing the large majority of states, for initiation of negotiations on a convention abolishing nuclear weapons and for creation of a body to monitor compliance with the Article VI disarmament obligation. They also watered down the language proposed by the humanitarian initiative, led by Austria, to reflect the results of the conferences on the catastrophic consequences of nuclear explosions held in Oslo, Nayarit, and Vienna. The nuclear weapon states appeared to accept, however, a provision stating that in light of the consequences of nuclear explosions, "it is in the interest of humanity and the security of all peoples that nuclear weapons never be used again". The same is true of a provision, reflecting the approach of the New Agenda Coalition, a small group of states from both the global South and North, that would have recommended that the General Assembly establish an open-ended working group to identify and elaborate effective disarmament measures, including a stand-alone or framework agreement for the achievement and maintenance of a world free of nuclear weapons. However, the provision also recommended that the group work by consensus, which would have given nuclear weapon states the ability to block progress. Despite the deep divisions, on the last day of the Conference, it appeared there would be consensus on a Final Document - except that the United States and Egypt could not reach agreement on the modalities for convening a conference, promised in 2010 but never held, to advance a zone free of weapons of mass destruction in the Middle East. For more on the Conference, see the analysis by LCNP Executive Director John Burroughs and another by LCNP International Coordinator Alyn Ware; see also this Washington Post story by Dan Zak. Looking forward, it is clear that the humanitarian initiative, focusing on the nature and consequences of nuclear weapons rather than on abstract doctrines of security and deterrence, is here to stay. By the end of the Conference, 107 states had signed the "Humanitarian Pledge" put forward by Austria. It commits signatories to efforts to "stigmatize, prohibit and eliminate nuclear weapons in light of their unacceptable humanitarian consequences and associated risks." It seems quite possible that non-nuclear weapon states will take action in the General Assembly (where consensus is not required) to establish a working group, or perhaps outside the UN. In this regard, see the recommendations of LCNP's international body, the International Association of Lawyers Against Nuclear Arms. LCNP and IALANA were active and visible before and during the Conference. Among other activities: IALANA Co-President and LCNP President Emeritus Peter Weiss delivered one of the civil society presentations to an official session. He said: "Oslo, Nayarit and Vienna have demonstrated that continuing the nuclear arms race is the devil's work, while a child could understand that a world without nuclear weapons is infinitely preferable to one in which such weapons exist." In another presentation, Andrew Lichterman of IALANA-affiliate Western States Legal Foundation outlined the threat posed by existing nuclear arsenals, stating that "nuclear weapons have once more taken center stage in confrontations between the United States, its NATO allies, and Russia .... These countries have turned a civil conflict in Ukraine into a violent proxy war in the borderlands of Europe." We also distributed a paper by LCNP President Guy Quinlan, "Taking Nuclear Missiles Off Hair-Trigger Alert." And John Burroughs spoke at several side-events, including one organized by the Hiroshima Prefecture, "Nuclear Weapons: Humanitarian Aspects and Legal Framework", and also presented and moderated at the Peace and Planet Conference held just prior to the Review Conference. At its first plenary, Jackie Cabasso, director of Western States Legal Foundation, read a message on the illegality of nuclear weapons from IALANA Co-President Judge Weeramantry. "It should be our collective goal to not only stop the spread of nuclear weapons, but also to truly achieve the peace and security of a world without them, and thus end the cycle of broken promises," said Tony de Brum, Foreign Minister for the Marshall Islands. in the opening session of the NPT Review Conference, on April 28. "That is why," he continued, the Marshall Islands presently has cases before "the International Court of Justice, which have brought this matter to the direct attention of the world's nuclear powers. After decades of diplomacy, the NPT's defining purposes remains unfulfilled, and those who are unwilling to negotiate in good faith will be held to account." Throughout the Conference, the Marshall Islands made a very good showing, speaking up consistently in support of the humanitarian initiative and of the commencement of multilateral negotiations on disarmament. On June 15, the UK filed preliminary objections, claiming that the Court has no jurisdiction and that its case is not otherwise appropriate for adjudication of the substantive issues of compliance with the NPT disarmament obligation. The Court has granted a request by India to extend the time for filing of its countermemorial on preliminary issues until September 16. Hearings are expected in early 2016 on whether each of the three cases are suitable for decision on the merits. At the request of the Marshall Islands, the Court appointed Judge Mohammed Bedjaoui as a judge ad hoc in the three cases. Judge Bedjaoui was President of the Court when it rendered its advisory opinion on nuclear weapons in 1996. A party is entitled to the appointment of a judge ad hoc when there is no judge of its nationality on the Court. Recommended reading: Robert Alvarez, "The Marshall Islands and the NPT," Bulletin of the Atomic Scientists, May 27, 2015, which includes an in-depth account of the history of use of the Marshall Islands as a "proving ground" for the US nuclear weapons program. Some 60 people turned out on May 11 for a spirited celebration of Angela Kane, departing UN High Representative for Disarmament Affairs. Co-organized by LCNP, the event was moderated by Cora Weiss of Hague Appeal for Peace and included a reading of messages of appreciation from Jayantha Dhanapala and others. A new page, "Climate Protection and Nuclear Abolition," offers a compilation of articles and presentations that explore the connections between climate change and nuclear abolition, "two of the most pressing existential threats to humanity." The page also includes a new letter to President Obama, sent June 10, on behalf of LCNP and Physicians for Social Responsibility, urging executive action on dealerting nuclear weapons and climate consequences of nuclear explosions. On June 22, the United States Conference of Mayors adopted a resolution calling for nuclear disarmament and redirecting nuclear weapons spending to meet the needs of cities. This marks the tenth year in a row this body has adopted such a resolution. This year's resolution calls on the US to support a process to negotiate the prohibition and elimination of nuclear weapons, and calls for the successful conclusion of negotiations with Iran. In her capacity as North American Coordinator of Mayors for Peace, Jackie Cabasso played a key role.